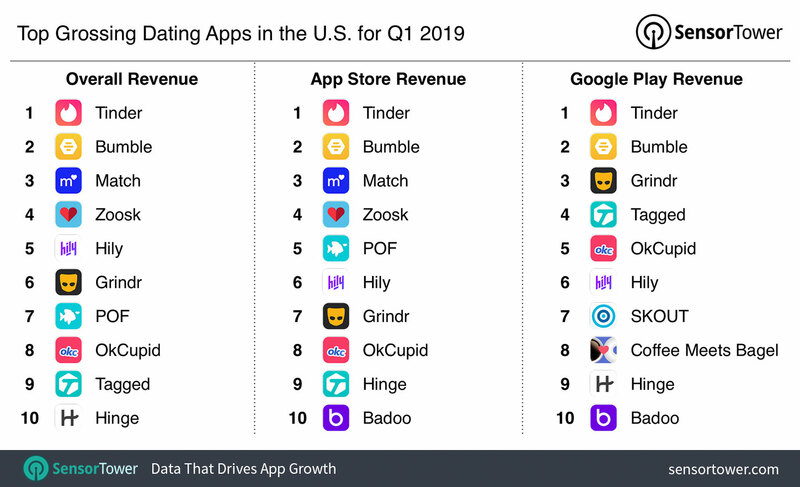 Sensor Tower has published its ranking of the highest grossing dating apps in Q1 2019 for the United States market. The overall ranking, combining iOS and Android revenue, saw Tinder claim the top spot. It was followed by Bumble in second, Match.com in third and Zoosk in fourth. Hily took fifth place, Grindr took sixth, and Match Group properties POF and OkCupid landed at seventh and eighth respectively. The Meet Group’s Tagged took ninth, and fast-growing Match acquisition Hinge showed up in tenth. Badoo and Coffee Meets Bagel both ranked on individual operating systems, but neither made the combined list. With $86 million, Tinder also claimed the top spot in a Q1 ranking of all non-game mobile apps by revenue. It replaces streaming giant Netflix, after that service began bypassing Apple’s fees by pulling the option for in-app subscription purchases. Other top grossing apps in the non-gaming category included Tencent Video, YouTube, Pandora, Line and Kwai. Sensor Tower estimates that Bumble’s revenue came in at around $37 million for Q1, marking 2X growth from 2018. Tinder grew around 65%. Clover, HOLLA, HUD and AsianDate all ranked in the list last year, but dropped out in 2019.